Insulated material containers, insulated material container combinations and insulated shelving containers offer optimal storage conditions for a dry and tempered material storage free from condensation water. 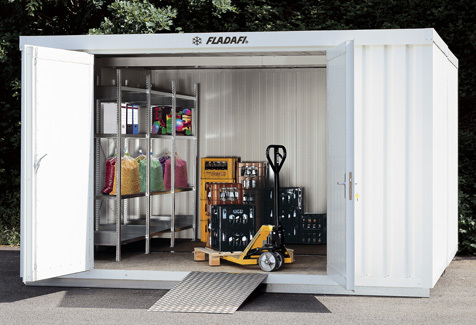 The insulated containers from the FLADAFI® range are designed for the storage of temperature-sensitive goods. The insulated outer skin compensates for temperature fluctuations and prevents condensation water. Additional heating and/or cooling devices increase the storage possibilities. The large equipment rage guarantees an easy, practical and field-proven handling, e.g. with access ramps, shelving systems, crane eyes, forklift guides etc. Insulated containers can be used as additional storage room, cellar alternative, technology shelter, store for bottles or cooling container. The solid construction of the containers with insulating sandwich elements protect sensitive material from all weather influences.